Toyohara Kunichika (1835-1900) Fan Print #2 (Uchiwa-e) Late 1860’s. We are very fortunate to have acquired three exceptional fan prints (uchiwa-e) by the artist Kunichika from the late 1860’s. There are almost no known examples of fan prints by Kunichika; those that there are are very rare indeed, still more rare are these examples which are in nearly mint condition and untrimmed. Fan prints (uchiwa-e) were produced by all ukiyo-e artists. Some - Hiroshige and Kuniyoshi for example - were quite prolific in the genre. The prints were intended to be cut out and adhered to fixed fans (uchiwa). After printing, when the paper had dried, the fan shape was cut out and pasted onto bamboo ribs. Although fan prints mounted in this fashion rarely survived given their ephemeral nature, there remain examples such as these, where intact sheets were never mounted. It is possible, given the regular holes on the right hand side of each print, that these were fixed into an album for use by a salesman or by the publisher. Fan prints were often made with summery designs to reflect the season when they were most used. These three prints are from a series devoted to kabuki dramas. 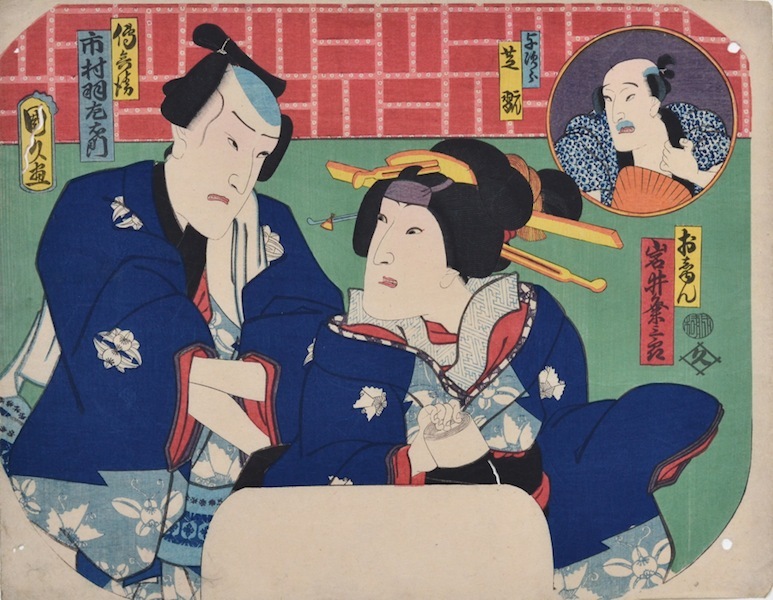 In this beautiful print, an onnagata actor and her lover (the clue here is the role of tissues she/he is holding revealing a sexual relationship) appear in the foreground whilst a third character is pictured in a circular cartouche in the top right. A rare print in exceptional condition, fine colour and impression. Album binding holes on the right edge.